Tree once again finds herself forced to repeat her birthday. 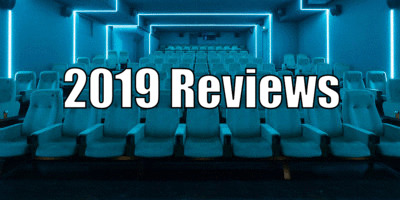 2017's Happy Death Day was one of the big genre surprises of recent years, a smart, postmodern deconstruction of slasher movie tropes that revitalised the overused Groundhog Day 'looping day' format. Taking $125 million from a $5 million budget, a sequel was inevitable, but could a sequel be delivered that didn't feel like a repeat of the first movie? Well, the cleverly titled Happy Death Day 2U doesn't feel remotely like its predecessor, because while Happy Death Day was a better Groundhog Day than Groundhog Day itself, Happy Death Day 2U is a shockingly awful take on the premise of Back to the Future 2. In the first movie, bitchy medical student Tree (a star-making turn from Jessica Rothe) found herself forced to constantly relive her birthday, December 18th, a day which ends with her death at the hands of a killer wearing the mask of the college football team, 'The Babies'. What was so clever about Happy Death Day, and what made it so gripping to slasher movie devotees, was how it gave us a protagonist who was essentially the character who usually dies first in a slasher movie, the narcissistic bimbo. In order to survive, Tree had to change her personality, becoming the sort of selfless hero embodied by the likes of Halloween's Laurie Strode. She had to become a 'Final Girl', and once she achieved this, she escaped the loop. Among its many retroactive crimes, this sequel tears up that idea, giving us a scientific explanation behind the time loop. It turns out that Ryan (Phi Vu), the nerdy roommate of Tree's love interest, Carter (Israel Broussard), has, along with two stereotypical Asian geek friends, developed a flux capacitor (or something), designed to slow down time itself, but somehow only affecting Tree. That is until Ryan himself wakes up to find he's stuck in a loop, and that a Babyface masked killer is out to get him now. When Ryan figures out a way to escape his predicament, it's bad news for Tree, who once again wakes up on her birthday, stalked again by the masked killer. Things are a little different this time however - the killer isn't her roommate Lori (Ruby Modine), Carter is in a relationship with the catty Danielle (Rachel Matthews) and in this version of December 18th, Tree's mother is alive and well. Much of the following drama revolves around Tree weighing up whether or not she should return to her rightful timeline. Doing so will mean her mother returns to the grave but she wins back the heart of Carter. But this is something of a non-dilemma. Surely it's a no-brainer for Tree to stay in the timeline where her mother is alive, as if it's meant to be with Carter, true love will run its natural course? The movie never expends much energy exploring this quandary, preferring instead to focus on a series of increasingly embarrassing comic set-pieces, none worse than a sequence in which aspiring actress Danielle pretends to be a blind French girl to steal a set of keys from the college Dean, a shameless knockoff of Jim Rash's camp Dean in TV sitcom Community. The humour throughout is of the dumbed down variety, with a piece of literal toilet humour rearing its ugly head at one point. You'll find yourself feeling sorry for the acting ensemble - who were all so endearing in the first movie - to see them reduced to such indignities. For long stretches, Happy Death Day 2U appears to forget it's a slasher movie, and the whodunnit element of who might be the killer behind the mask is rendered inert as the suspect may as well be wearing a sandwich board bearing the words "I am the Babyface killer." The first film's director, Christopher Landon, takes over the writing duties from Scott Lobdell, and it's all too clear which of the two was responsible for the success of the original. Landon's script suggests he hasn't even seen the first movie, let alone directed it, as this sequel so often breaks the rules established so well by Lobdell. In one of the film's cringiest moments, Tree commits suicide by dropping a hair-dryer into her bathtub, waking up the following morning, or rather the same morning, with her hair all frazzled like a Looney Tunes character. This would suggest that Tree carries the physical scars of her deaths into each recurring day, but we never see the gruesome effects that would result from her other demises. Why doesn't she wake up with a scar on her neck when her throat is slit, or with half her head caved in when she's been bludgeoned by Babyface? Lobdell's script for Happy Death Day was airtight, which meant we never found ourselves asking such questions and could settle into engaging with the story. Landon's script for the sequel is such a convoluted and contradictory mess that by the movie's climax you'll find yourself nursing a worse migraine that the one Tree wakes up with every recurring morning. Not since Piranha 3DD has a horror sequel so completely misunderstood what made its predecessor work. If I ever find myself forced to repeat a day over and over again, I hope it's not February 11th, 2019, the day I saw Happy Death Day 2U. Happy Death Day 2U is in UK/ROI cinemas February 13th.